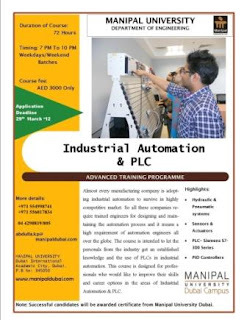 Department of engineering announce Advanced Training Programmes in “Automation and PLC” and “Computer Integrated Manufacturing (CIM)” for Industry professionals. The training program includes 72 hours of theory and practice sessions on the state of the art equipment in our newly established laboratories. The classes will be conducted during weekdays/weekends from 7 pm to 10 pm. 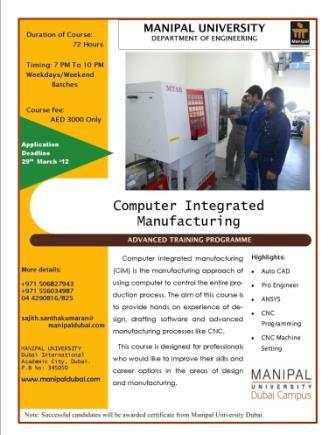 The course content is designed to enhance the technical skills of the participants. The successful candidates will be awarded certificate from Manipal University Dubai.